The 2012 season for Bike Aboard! on the Cuyahoga Valley Scenic Railroad has begun! For only $2, you can take your bike on the train and ride one-way. You can board and get off at any station between Akron Northside and Rockside Road in Independence. 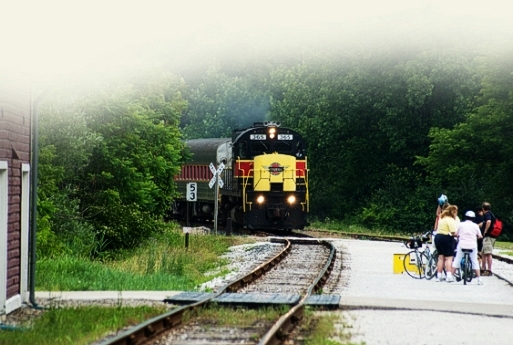 You can ride ride the Towpath Trail, then catch the train back to your starting point, or vice-versa! If you plan to Bike Aboard! using one of our rental bikes from our Peninsula store, we recommend that you board the train in Peninsula, ride the train to your destination, and then ride your bike back to Peninsula. The Bike Aboard service is on available on weekends only in April and May. Daily service Wednesdays through Sundays begins in June, and continues through October. Included in the link above are the daily railroad schedules, train station locations along the Towpath Trail, and a mileage chart that lists the biking distances between each of the train stations! Bicycle Touring Season has begun! New from Shimano: SPD-compatible flip-flops!